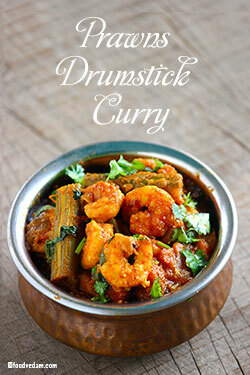 Prawns Drumstick Curry Recipe with step by step instructions.తెలుగు వెర్షన్. one of my YOUTUBE subscribers asked me to post this recipe.I Had never prepared this curry before.that means I never cooked prawns along with drumsticks.I usually prepare mutton drumstick curry, Fish drumstick curry, and egg drumstick curry.but for the first time I tried this recipe and it turned out really good. I have used medium prawns but you can use big or small prawns.usually, prawns are sweet in taste.so you can add a little more red chili powder than usual.you need to be little careful white sauteing the drumsticks.they may split apart if you stir the curry vigorously.you better use mature(not fully mature) fleshy drumsticks rather than using tender ones. 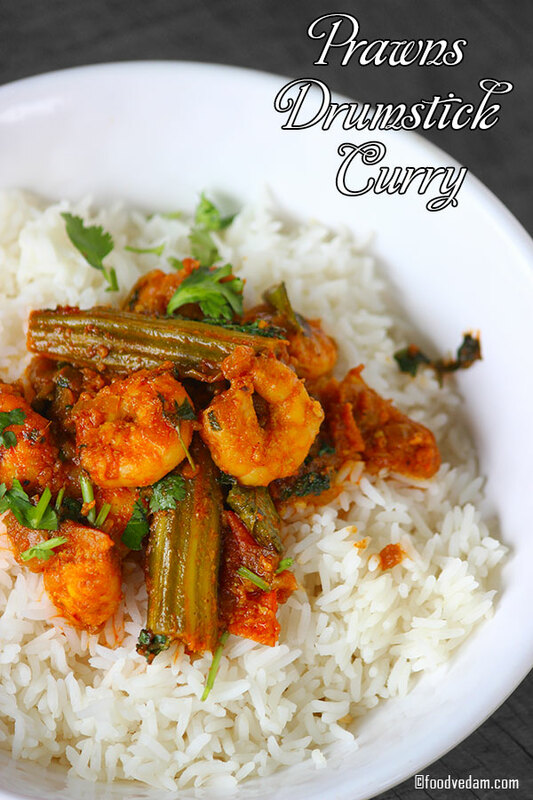 If you are using frozen prawns, make sure that you defrost them properly before cooking.otherwise, they may turn hard after adding to the curry.I didn’t use coconut milk but you can use if you like.you can add it instead of water.It tastes good with hot rice.Hope you try and enjoy the recipe. Click here to watch more recipe videos on our YOUTUBE Channel. Devein the prawns and rinse thoroughly. Heat oil in a pan, add chopped onions, green chilies, drumsticks, and salt. Mix well and sauté until the onions become soft or until the drumsticks turn into olive green color. put ginger garlic paste, curry leaves and sauté until the raw flavor disappears. Add turmeric powder, red chili powder, coriander powder, mix well. Later, add prawns, mint leaves and mix well.cover and cook for 5 minutes. Pour water, mix well, cover and cook for 10 minutes. Add garam masala and cook for 2 minutes.